On Monday 19th June at 2am David and Ann Rhodes had a lift from their next door neighbour to Sarn, Bridgend, where they caught a bus to London Heathrow airport. The British Airways plane took off on time and after 8 hours landed in Nairobi. David and Ann already had Kenyan visas in their passports but ended up in a queue where people were buying visas. Eventually they picked up their bags and looked outside for those meeting them. They had arranged to briefly meet the head of Bookshine School, Jack Oyieko, and his wife Maureen. Pastor John Amingo Oyoga together with Henry and Malak were waiting with Jack and after a while David and Ann were taken to a hotel. They left at 8.40am on the long journey to Kisii County. On the way they stopped to buy food supplies and Ann passed sweets out for children but was soon surrounded by adults wanting some. By 1.30pm they crossed into Kisii County. When they arrived at Pastor John’s house they soon met Pastors Samson, Anna and Lawrence. They talked about the mission and were given a sheet that laid out the plan. The leaders day started with Kenyan style worship. The pastors and leaders present, introduced themselves. Soon David and Ann prayed for those who were sick. Eye sight was restored, pains in shoulders and legs disappeared, ulcers and hearts were healed. They also prayed over family problems. After a break the congregation split in two. Ann spoke to the women about having the right foundations, followed by prayer and questions. Meanwhile, David spoke to the men about weakness being normal. Questions were asked and many gave testimonies of being healed earlier. After a lunch break all the leaders were together for another session. David spoke about the authority Christians now have. David and Ann together prophetically gave keys to those there, just as David had done for many years in the Philippines, Uganda and in the UK. On Thursday the plan was to visit 3 churches. Malak drove us first to Entakana where they started with worship. A young man’s arm was straightened and a lady that was disabled from birth became pain free. They then drove on to Ekerema via a narrow track. A man who had suffered a stroke and those with arthritis were healed. Ann encouraged all the people to exercise and Pastor Peter later declared after joining in the exercises his arm was healed without any prayer. David spoke from Isaiah 61 about the Spirit of the sovereign Lord being on us. Next they moved onto Nancheki. 16 were prayed for, with two prayed in proxy for family. David shared some testimony and Ann spoke about Philip from Acts. Prophetic keys were given and the Lord indicated some would be working together in ministry. On Friday morning six people turned up at the house for what we called ‘morning surgery’. The needs included epilepsy, stomach pains and arthritis. After prayer all pains had gone. They went on to Nyangeni where the church was like a tabernacle. Ann shared a testimony and then David spoke from Psalm 23. They prayed for healing and more keys. 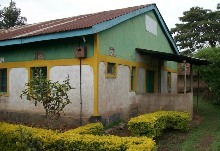 The next church in Nyangonda was in a mud walled hut. David shared testimony and Ann spoke about walking on water from Matthew 14 and feeding the 5000. There was prayer for healing and deliverance. At Ekerubo David shared testimony, then David and Ann prayed for 8 who were sick, particularly for headaches and for leg pain. On Saturday the first attempt to get to Nyaronge was blocked, so they went on to Chiengo. There was a worship time. David then spoke about prayer from James, John and Philippians. David prayed over a handkerchief for a girl’s mother and later heard the mother was healed when she took it home. A young man that had become dumb, after prayer, ended up speaking, then singing and playing a guitar leading worship. They found a way back to the Nyaronge church who used to meet in the forest but had built a frame on open ground and put leafy branches on top to give shade. Ann shared some testimony which led to several receiving Christ into their lives. As they needed to move on to the next place, they quickly prayed for people, who were all healed. In Magena David shared some testimony and spoke about Ephesians 4 ministries. He then prayed for keys again. When they returned to the house 3 had come for prayer and were healed. On Sunday morning Ann led the Sunday school. It started with a few of the youngest children but gradually teenagers, then adults joined in as Ann was teaching. Worship time was led by people from several churches. Testimonies of healings and homes restored since the start of the mission were shared. A prayer handkerchief was prayed over for a mother and later it was reported she was healed. At the main service David shared about healing questions Jesus asked. There was a long line for prayer. Those healed included, people with sight problems and headaches. Ann gave out gifts to all the children. Late that evening a lady with neck pain and finger clicking was healed. When they arrived at Kiongendo on Monday they found the church met in the open air. Several children arrived as school was closed that day. More and more people arrived. Some sat on mounds of earth while others used chairs that were brought over. David spoke about need for action, as every place they put their feet will be theirs. The church at Etono was a frame with a tarpaulin. Ann spoke about feeding the 5,000 before they both prayed for healing. When they arrived at Rioriango they visited the pastor’s house. Then they went to the church. David spoke about how it is not enough to know the word, we must put into practice. Again they prayed for the sick and for keys. To get to the church at Eengo they had to climb up the side of a hill where they met among the trees. David spoke about acting on what God says. We have God promises but we have our part to fulfil. They prayed for family salvation and restoration. Those healed had sight and leg issues. They were asked to pray over the plot where the church is to be built. Early on Tuesday Ann prayed with two ladies with back problems that were healed. When they arrived at Nyagancha they had tea at the house. Outside a man sat waiting for prayer. His sight was restored and legs healed. At the meeting David spoke from Acts on how Peter knew what he had and the need to know what we have. The sick were healed and keys were given. The Lord indicated that he was specifically calling some to work together in ministry. At Egoti there was a long walk downhill to the church. Ann spoke about Abraham’s sacrifice. The sick were prayed for and keys given. One young man stood out as keen, even running to get in the prayer line. In Ribate, David and Ann went straight into prayer. They prayed with a young boy who had been treated for cancer. Lots of children joined in a circle as David and Ann prayed for them. At Eburi David shared a testimony of what had happened in the mission so far, and the need to hear God’s voice and then do it. Again they prayed for the sick and everyone was healed. Keys were given to the children first. Back at the house food was provided. Later on two women asked to have an anointing to pray for the sick. On the Wednesday, the final leaders’ meeting started with testimonies of experiences during the mission. David taught, as he had been requested, on biblical finances. This was followed by a question and answer session on finances. David and Ann again prayed for healing and keys. At this final meeting David was given a shirt and Ann a dress, made just for them. David prayed for a breaking of the spirit of poverty. The leaders then prayed for David and Ann. Their final day in Kenya started with two people coming for prayer. David and Ann also prayed for John’s family. They travelled to the airport with Pastor’s Peter and John, and with Malak driving. They arrived at the airport by 6pm. They waited for their flight, due to leave 11.15pm. At Heathrow it looked like they were the first plane to land on that Friday morning. Very quickly they got through passport control and baggage pick up, and managed to change their bus home for an earlier time. John kept a count of how many times David and Ann prayed with people. His figure was just under 600, out of that it is estimated about 400 was for healing. The great majority were healed instantly. After David and Ann returned home a report from the church came saying the congregation had doubled on the next Sunday and they had prayed for sick people and they were also healed. Pastor John recorded 445 people who were given keys in the mission had tremendous breakthroughs. These included, ongoing healing, a flow of soul winning, home curses and conflicts were solved, resources breakthroughs, bad dreams disappeared and children’s schoolwork have seen improvement. Not all were listed by Pastor John, but calls had been received so far, saying 378 of those prayed for were healed, among them were partial paralysis, rheumatism, mental affliction, myopia, chronic malaria, and other contagious fevers.